...A soap opera filled with headless horsemen, impossibly strong bartenders, street gangs, magical swords, and even Russian sushi. Back when Durarara! !x2 started its run in January of 2015, I decided to watch the original Durarara!! series from 2010 in preparation for a possible review. But as I finished, I found that I didn’t know how to tackle such a beast. It’s a plot with so many characters, so many sub stories, and no true final resolution; I wasn’t sure how to start. So instead I watched and waited for over a year for x2 to finish. And over that time, something became clear to me: Durarara is a soap opera. Rather than being solely about a small set group of main characters, it is the story of an area: Tokyo’s Ikebukuro district. Of course the Ikebukuro in Durarara is far more interesting than its real world counterpart. It’s got all sorts of supernatural events, impossibly strong humans, and teenage gangsters by the score. Characters flow in and out of the story as they rise and fall in importance to the events transpiring in the city. Some routinely appear and have an important leading role for a handful of episodes. Then they disappear from the plot entirely while others become background supporting roles. But even characters gone for a score of episodes can suddenly return to prominence as the state of the city shifts one way or another. Because of this, there aren’t really “main characters” in Durarara as much as there are “central characters,” i.e., characters whose nature or position can trigger chain reactions throughout Ikebukuro. But even these few are often absent from the story episodes at a time. The first group of these central characters are the teenage love triangle of Mikado, Masaomi, and Anri. In the first season, the three were the best of friends in their normal life, all while keeping world shattering secrets from one another. Mikado is the secret founder of an online-based street gang. Masaomi is the former leader of a more traditional street gang. And Anri is the vessel for a mystical sword that controls people’s minds with just a single cut. Because of these three secrets, their respective lives spiral out of control. Durarara! !x2 deals with the fallout. Masaomi is in self-imposed exile from Ikebukuro and both Mikado and Anri long for the days when they were just normal friends. This sets Mikado on a course to try to make that dream come about. To do this the often passive Mikado lets himself be herded into an active role and starts purging his gang of any and all undesirable members, usually at the end of a baseball bat. But like many of us, Mikado eventually realizes a troubling fact: He actually enjoys the rush he gets when trying to deal with things outside a normal life. From this, he starts to worry about what he will do in the future for this rush. To put it another way, he fears he is becoming a bad person, and this fear becomes a self-fulfilling prophecy. And instead of fighting the change, he harnesses it, setting in motion a plan to make Ikebukuro into a place where the three could be normal friends even though he no longer feels like he belongs. The main thing the original Durarara!! lacked was a solid conclusion to its myriad of running plotlines. x2, on the other hand, comes with an ending that feels like such a good stopping point that the anime could never continue and I’d feel content. This is because the story not only resolves Mikado’s machinations but Celty’s story as well. Like Mikado, Celty is one of the focal point characters of Durarara! !x2, and she deals with many of the same issues as he does. But while Mikado is a normal person who longs for the abnormal as much as he fears what it does to him, Celty is an abnormal creature (a headless Irish Dullahan) who cares little for her supernatural nature and wishes nothing more than a normal life with the man she loves. But regardless of what she wants, the fact that she is a creature out of legend keeps her at the center of any number of plans to capture her, study her, or otherwise use her for monetary gain. If all the characters and plots in Durarara are a hurricane, it is Celty’s missing head that is the eye of the storm, the object around which everything else revolves. Who has it at any given time and what their plans for it are radically changes the mood in Ikebukuro. So resolving all possible questions about its fate and power in relation to Celty certainly make the ride feel worthwhile. 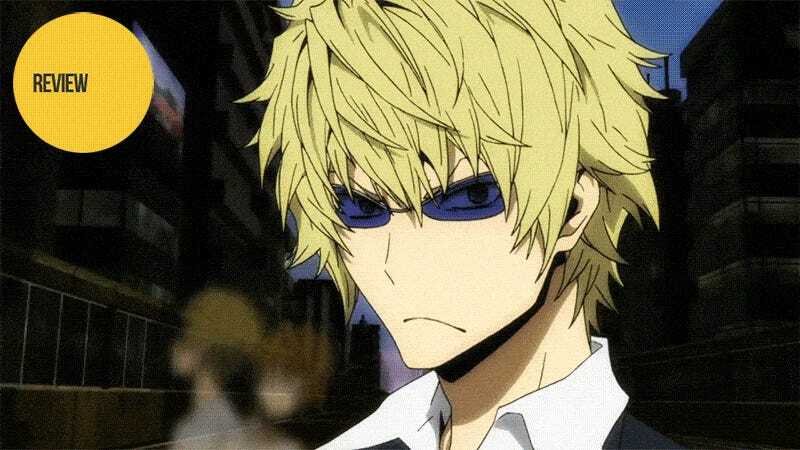 One of the other interesting things about Durarara in general is that there are no real good guys or bad guys. All the characters have layers to their personalities and goals that are far from black and white, be this the Yakuza who looks out for a dead friend’s daughter or the popular idol who moonlights as a serial killer. This even holds true for the main antagonist of the series, Izaya. While Mikado loves the abnormal and Celty tries to reject it, Izaya loves humanity, namely watching how people will react in certain situations. His plots and schemes have little evil intent. Rather he simply seeks to stretch events and relationships to the breaking point so he can then watch how everything comes out. Because of this, he plays all sides, helping or hurting the other characters if it brings things closer to his chosen tipping point. This makes him a great villain, one who can do anything from pull strings in the background to grant favors for the desperate. Durarara is a supremely hard anime to rate. Some characters and their stories are excellent while others range from pointless to forgettable. Breaking down every single one would take dozens of articles, not just a single review. That said, if you want to experience a hyper-charged version of Tokyo filled with a plethora of complex and colorful characters, Durarara is the soap opera for you. Both Durarara!! and Durarara! !x2 aired on Tokyo MX in Japan and can be viewed for free and with English subtitles in the US on Crunchyroll and Hulu.